Floating Rocks phenomenon is excited to be discussed in cyberspace these days. How not, a giant stone that is big and very heavy to lift, easily floats in the air. Most of these stones float for no apparent reason, and cannot be explained logically. 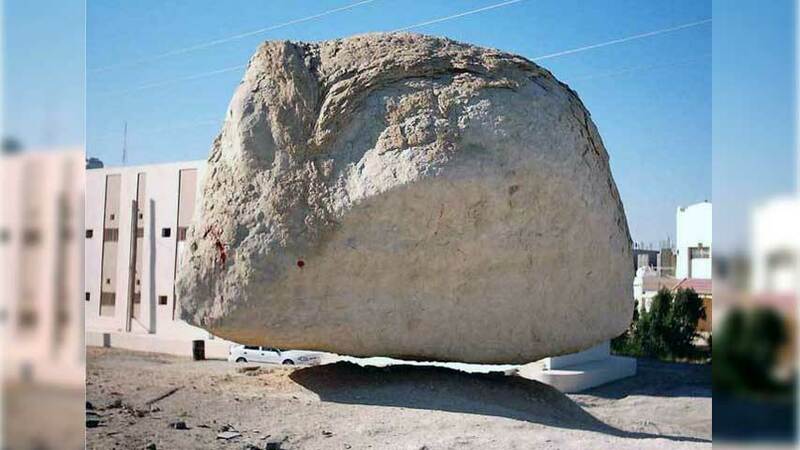 Eyewitnesses generally see this stone floating without the help of any rope or support. They also offered some evidence that strengthened their testimonies. 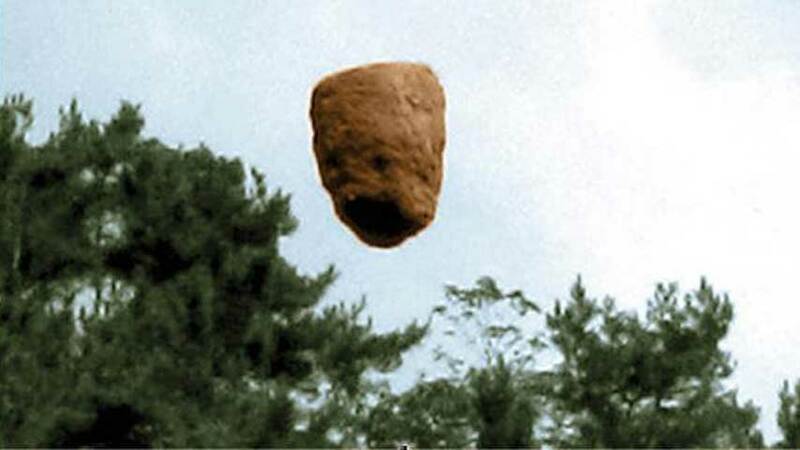 Regardless of whether this incident is true or not, the phenomenon of floating stone is an interesting topic to discuss. Here are some reports of floating rock phenomena that occur in various parts of the world. This photo was taken by someone named Mr. Gang Hao on July 19, 2009, around his home in Gushan City, China. At first, he did not see the stone, but when he examined the photographs he shot, there was an unusual view of one of the images. Unexpectedly there was the appearance of a pile of rocks floating above the trees. Immediately he contacted psychics and UFO researchers to solve this mystery but no one gave a definite explanation. If the scale of the stone is estimated to be the size of a sedan. Mr. Gang Hao also claims that this photo is original without any editing touch. But many netizens consider the photos to be photoshop editing. This photo has long been viral on the internet, many people still believe in the authenticity of this photo. This stone hovers in the village around Al-Hassa, Saudi Arabia. According to eyewitnesses every April the stone floated 11 cm high for 30 minutes. According to the story 17 years ago there was one of the Mujahideen terrorists shot dead behind the stone in April 1989. The bloodstains were still fresh on the rock surface. Residents have tried to remove the blood, but the blood appeared mysteriously again. Even stranger, when this stone floats, blood spots turn darker, fresher and wet. Although it looks convincing, this photo remains doubtful for some graphics experts. According to the fact in the field before this stone had a small support under it then it was removed by the editing process. If previously only one stone floated, this one actually took another stone. The phenomenon of the overthrow of this stone is thought to be related to the history of the rise of the prophet Muhammad to the seventh heaven along with the angel Gabriel using Bouraq. This stone is real and not edited and really exists. You can find this floating stone at Cairo Airport in Egypt. Every tourist who visits does not forget to capture the amazing moment when this stone is pulling another stone using a rope. 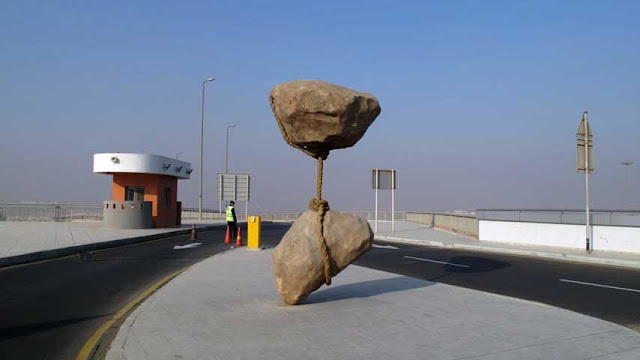 Many people are confused about the purpose of the rock floating in the middle of this road. According to people around the stone, this is the work of an architect who died at the age of 41 years. So this floating rock is an optical Illusion that uses invisible balance and buffer techniques. 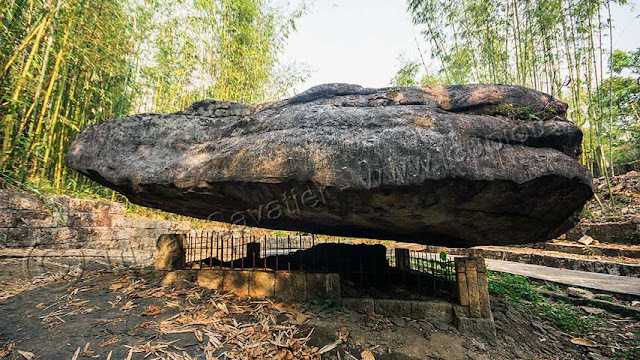 In India also has its own floating rock phenomenon, in the forest area of Mawlynnong, northeast of India. It was very clear that a very large rock floated without any support. This picture was posted by a user on the loupiote.com website. He also wrote a brief description of the description as follows: "On a special day every spring, in just a few minutes, this large rock quietly rises and appears to float in the air some inches from the ground. With the most extraordinary opportunity, I was there at the right time and managed to take photos of an unexplained phenomenon that only a few people had witnessed before. " Whether it is true or not there is no further clarity regarding this phenomenon. There are 2 stones, one weighing 55 kg and the other 41 kg. 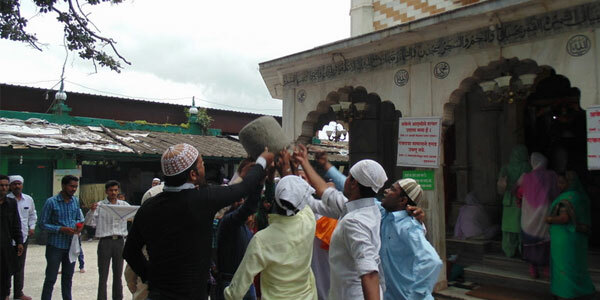 This stone is located in a temple in the village of Shivapur, Mumbai, India. But this is not an ordinary stone, this stone can fly easily if 11 people touch the bottom of a large rock and 9 people for a small rock with the index finger of their right hand. If all the compact people chanted the word "Qamar Ali Darvesh" then the stone would float above their heads for 2 seconds. That said, there was a legend of a man named Qamar Ali Darvesh. He is a burly but very kind man. He is also a devout Muslim, he often heals people's illnesses with his supernatural powers. Before he died he ordered to put a 200-pound stone near his grave and advised, "if 11 people put the right index finger on this stone and call my name, then this stone will float as high as 2 meters". Many European scientists flocked to investigate this irregularity. This floating stone is not clear where, when and how. The descriptions are only listed "Quran 41:53:" We will soon show them. "" Our signs in the Universe and in their own souls ". This video is very short, but it looks very real this stone floats without any support and support. Maybe the uploader tried to show the audience the power of God that made this stonefly. Although there were so many comments from netizens, they thought this was CGI (Computer Generated Imagery) like in movies.